A 30 years old male brought to casually with a CT showing intra ventricular bleed for further evaluation and management. MRI Axial T1w images of brain shows an intra ventricular bleed in left lateral ventricle (yellow arrow), T1 bright meth Hb – a sub acute stage blood degradation product. 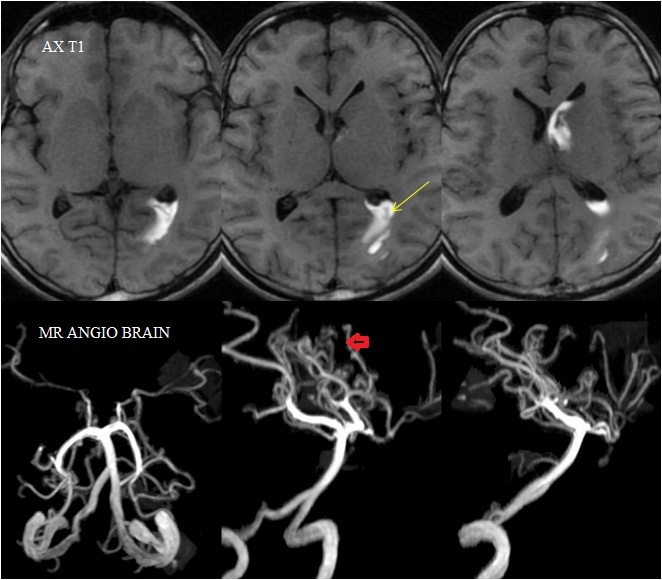 3 D TOF MR Angiography of Brain shows non visualization of intracranial portion of both the ICA. Both the MCA show poor flow related signal with marked sparsity of cortical branches of MCA on either side. Lateral and oblique view showing collaterals from PCA giving puff of smoke appearance (Red arrow). Diagnosis: Intraventricular hemorrhage in Moyamoya disease. Moyamoya disease is a bilateral steno occlusive disease of the intra cranial internal carotid artery. Moyamoya is a Japanese word for a "puff" or "cloud of smoke" , and it has been used to refer to an extensive basal cerebral network of small anastomotic vessels at the base of the brain around and distal to the circle of Willis secondary to segmental stenosis or occlusion of the terminal parts of both internal carotid arteries. The basal vascular network is contributed by lenticulostriate, chorioidal, thalamoperforating, premammilary and thalamogeniculate arteries, as well by to unnamed branches arising directly from the circle of Willis. Pseudo aneurysms and micro aneurysm are well reported along these collaterals and circle of Willis. Pathogenesis of MD is not well understood. Various theories of inflammatory and immunologic mechanisms remain unproven. Very high concentration of basic fibroblast growth factor (bFGF) with high angiogenic activity in Csf samples of patients typical imaging findings of Moyamoya disease. There are strong evidences to support hereditary and familial factors especially among the Japanese. Clinical manifestation of MD include ischemic symptoms common in children where as intracranial bleed in the form of subarachnoid bleed, intra parenchymal or intraventricular bleed common in adults. Causes of intracranial haemorrhage in MD are rupture of dilated fragile collaterals or rupture of aneurysms along the circle of Willis and basal cerebral network of collaterals.